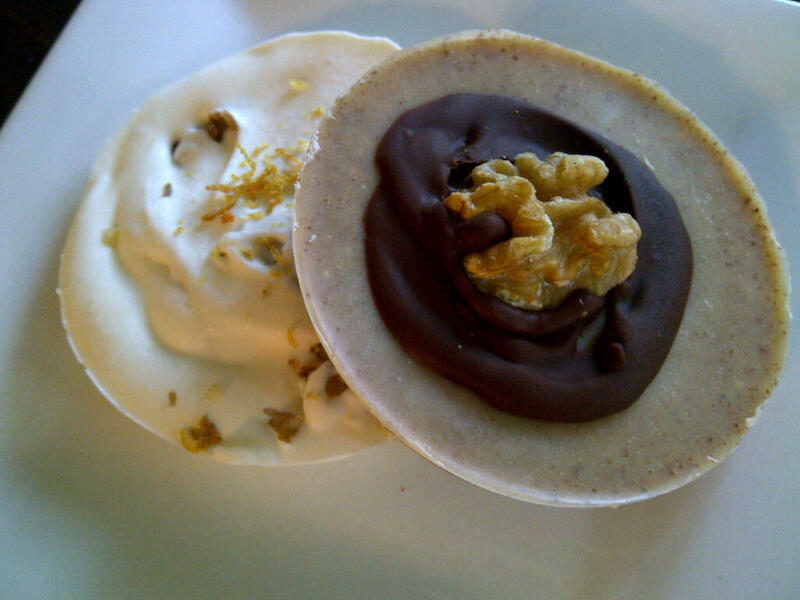 Fat Bombs… Although they look and taste as decadent as something from a forbidden confectionery boutique, they play a crucial role in the HFLC diet, providing an important source of energy in the form of healthy fats. YAY!! HFLC: translation, High Fat Low Carb Diet! I never thought I would use the words “fat bomb” in a sentence that had to do with my daily food intake, but there it is! If you are an experienced low-carber, you may familiar with the concept… and if you have been hanging around the Wheat Belly Facebook page lately, you may have already seen amazing versions of these two recipes. When restricting oneself to a very low carb diet for the purpose of burning body fat, it’s important to replace those carbs with fat as the primary energy source. Intellectually, I “know” this, but I have been struggling with getting enough fat in my diet. While the methods I started a couple of weeks ago to break my weight loss stall did work and I lost 2 new pounds, I still feel that I am too low in my intake of healthy fats. Enter the FAT BOMB! They are concoctions of healthy fats (coconut oil, butter, cream cheese, nut butters) that taste great and help us to get enough fat in a day. These are just 2 variations on a theme, and I do not take credit for originating them at all… I merely tweaked them, photographed my outcome, and am passing on information to others who are likely going through the same learning process that I am. I already have other variations in my mind (maple extract and toasted pecans instead of lemon juice? cashew butter instead of almond? we’ll see!) Feel free to tinker with these yourself, but be aware, they are addictive! 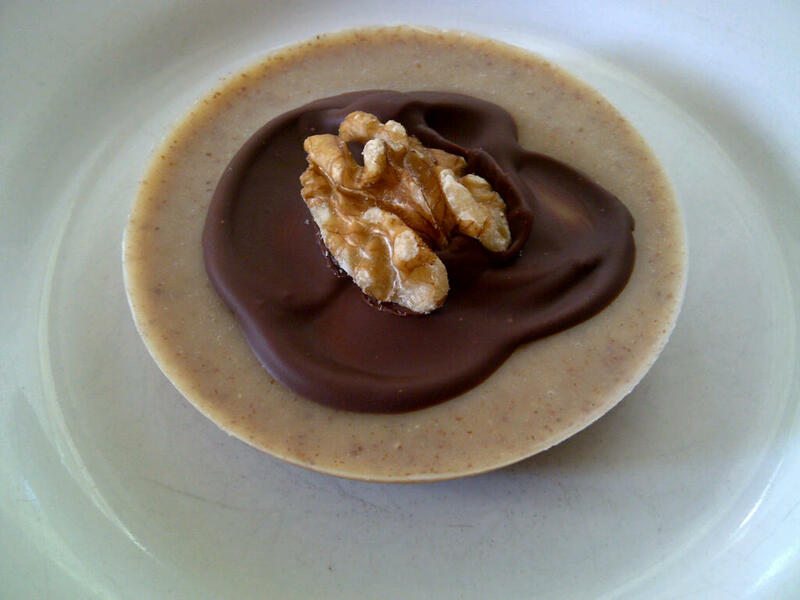 Do you have any favorite combination of ingredients for Fat Bombs? Start by creaming together the cream cheese and butter, then add other ingredients one at a time and mix well in between. I like mine sweet/sour, so you may have to adjust your flavors to your taste. I have made them using the wells of a small muffin-top pan (pictured) but also have used mini muffin cups. Freeze until firm, pop out and refrigerate. My Favorite Guacamole! Avocados are an abundant source of Omega-3 fatty acids, fiber, potassium, and folate, along with vitamins A, C, E, K and B6. The many different anti-oxidants found in avocados help prevent inflammation. This is a guacamole recipe that I tweaked years ago, and I am often asked for the recipe when I take it to parties to share with friends. It’s naturally grain-free, gluten-free, Wheat Belly and primal friendly. 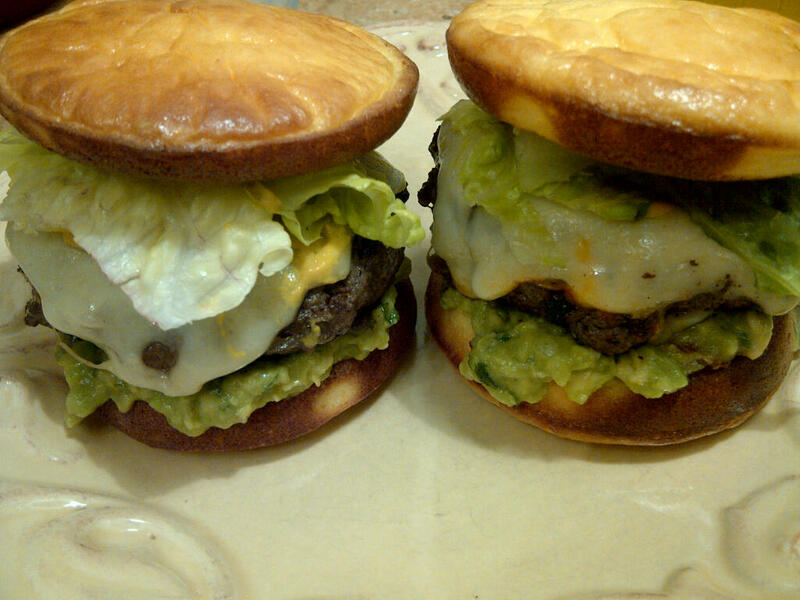 Tonight I’ve made a 1/2 batch to serve on grilled burgers with melted muenster cheese and grain-free, low-carb buns. Mmmmmm! It’s also great as a dip for veggies, low-carb cheese crackers and even pork rinds 😉 Low-Carb and lovin’ it! 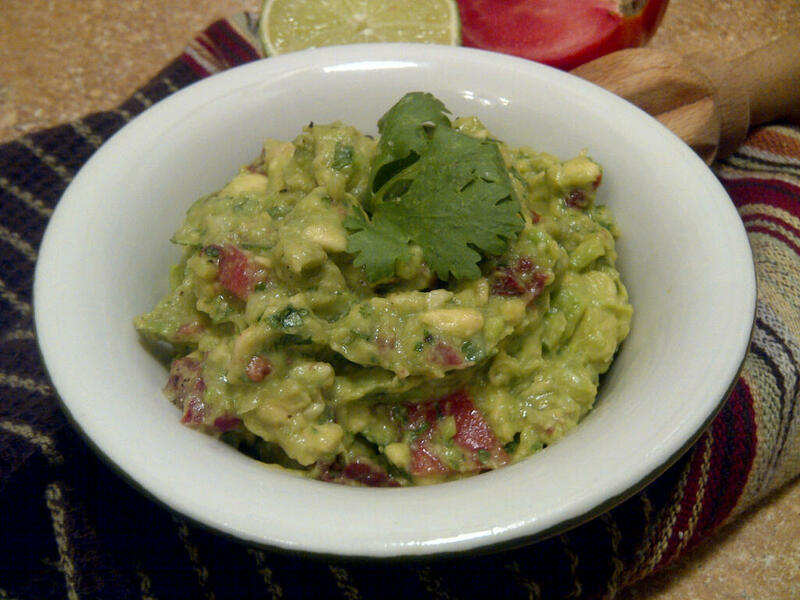 Halve and pit the avocados; scoop out the flesh with a tablespoon into a mixing bowl. Mash the avocados with a fork, leaving them still a bit chunky. Add the remaining ingredients, and fold everything together to gently mix. Lay a piece of plastic wrap right on the surface of the guacamole so it doesn’t brown and refrigerate for at least 1 hour before serving. Some dishes are naturally grain-free and low-carb. 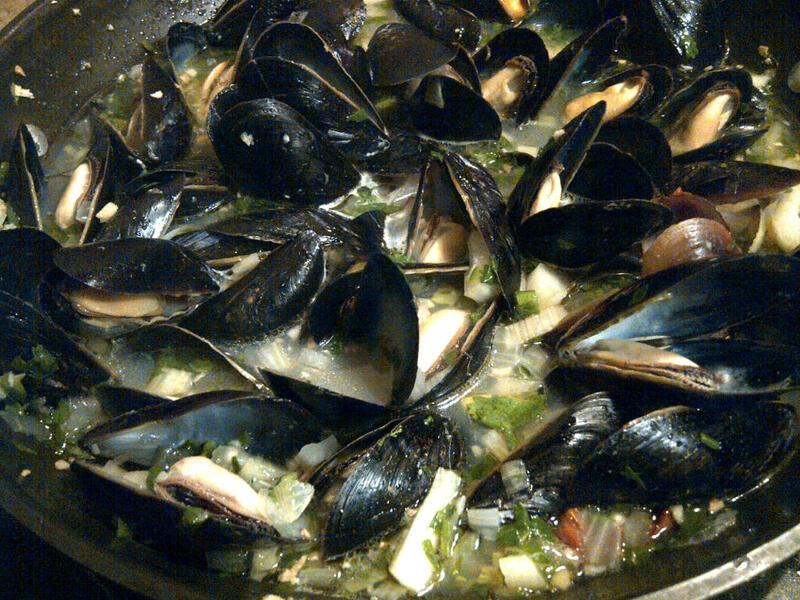 Mussles is one of those, though in the old days, I would have sopped this up with crusty bread. For the most part, we aren’t big on eating breads anymore (even the grain-free ones) but if you are, by all means, enjoy it with this broth!! This is one of those thrown-together recipes that just sort of happens and is dependent on what I have on hand. 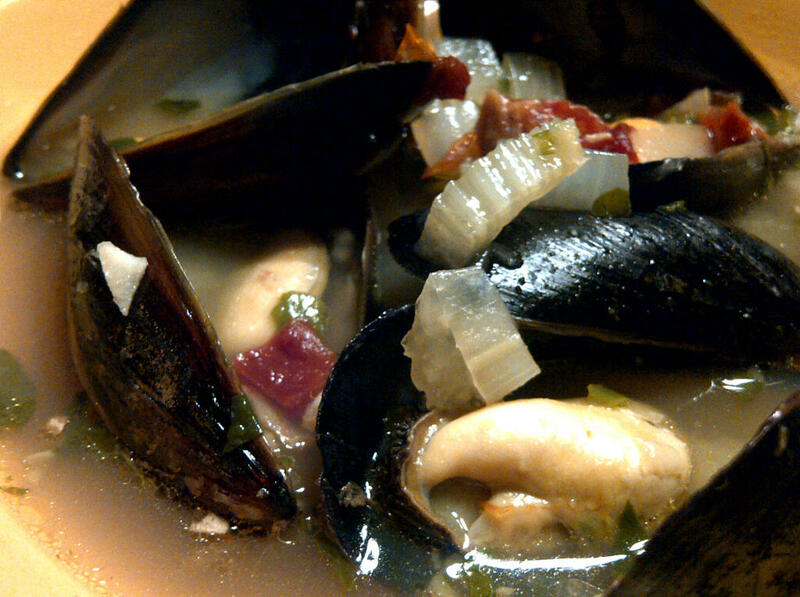 We had a bag of mussels to use, so I decided to saute some diced vegetables in coconut oil, add some chicken broth and chopped cilantro, and use the broth to steam mussels. Again, not so much of a recipe as a list of ingredients that can change depending on what you like and what you have on hand. This had a nice spiciness to it without being too hot, and the ginger, garlic and cilantro add balance. The sun-dried tomatoes are slightly tangy and sweet, softened in the broth, and the fennel adds a slight hint of sweetness as well. 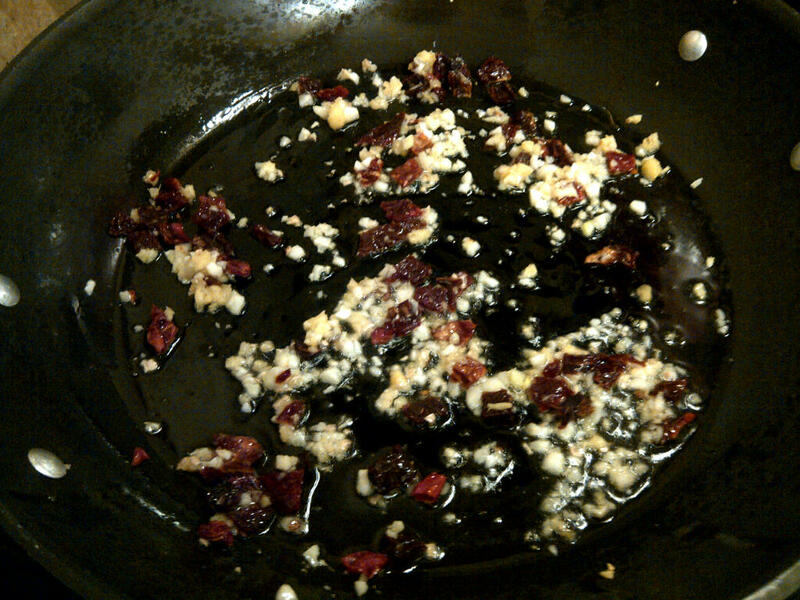 Saute all above ingredients together until they begin to soften. Sauteing chopped vegetables to soften. 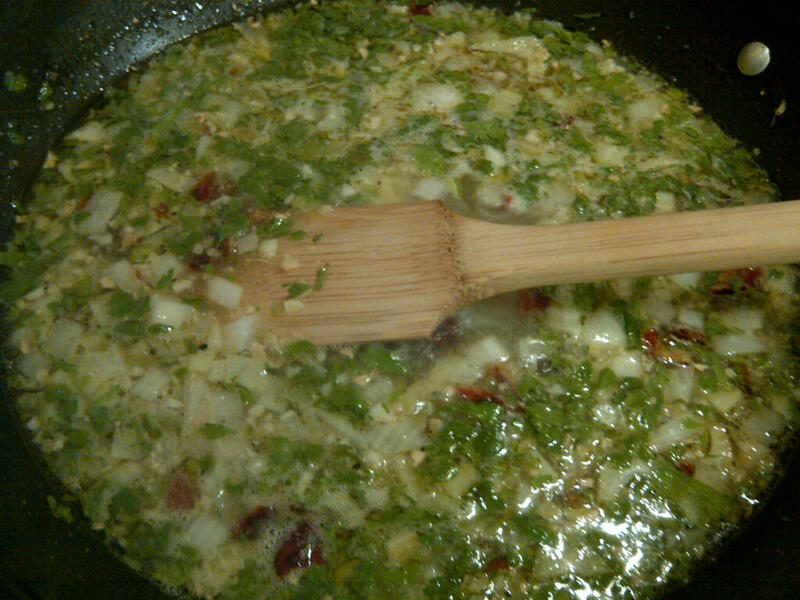 Add broth, cilantro and seasonings and bring to a boil. With broth, cilantro ans spices added in, brought to a boil. 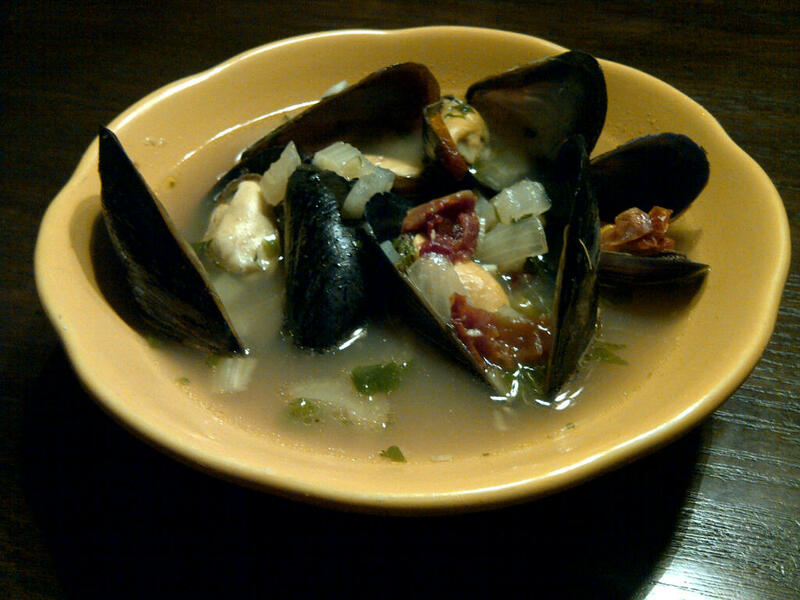 Delicious bowl of mussels in spicy broth! 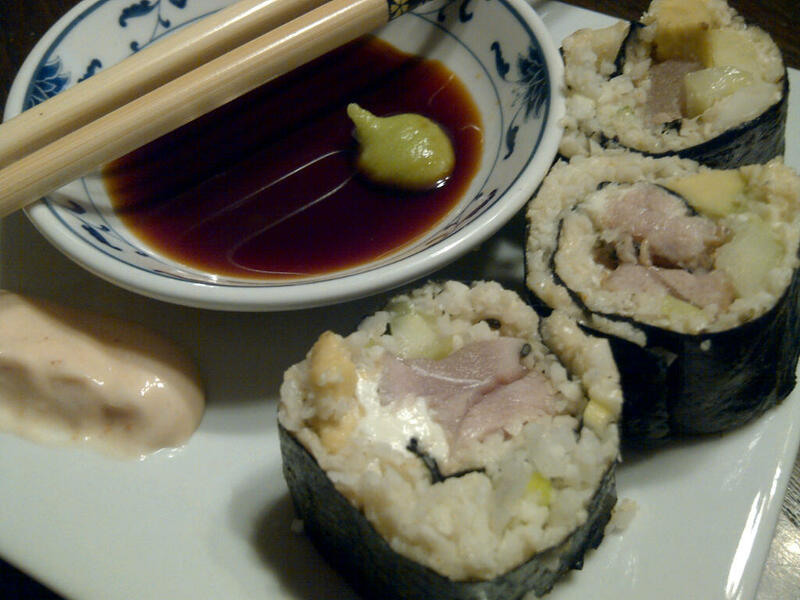 Cauliflower “Rice” Sushi rolls with seared yellowfin, avocado, cucumber, green onion, cream cheese and sriracha. Served with sriracha mayo, tamari and wasabi. This is our first attempt using cauliflower rice, and it was rather unplanned, the colors aren’t as vibrant as I usually prefer (so I added some black sesame to jazz it up), but the taste was wonderful! Have I mentioned lately that I love seafood? Like almost ALL of it? I enjoy most fish and shellfish, and have consumed it grilled, sauteed, baked, broiled, steamed, poached, raw… you get the idea. In fact, one of my biggest culinary revelations was when my husband and I first tried sushi about 10 years ago in Ann Arbor. It was a sushi restaurant, but what we ordered turned out to be a LARGE sashimi platter just loaded with every type of raw sea delicacy I could imagine, and some I hadn’t! 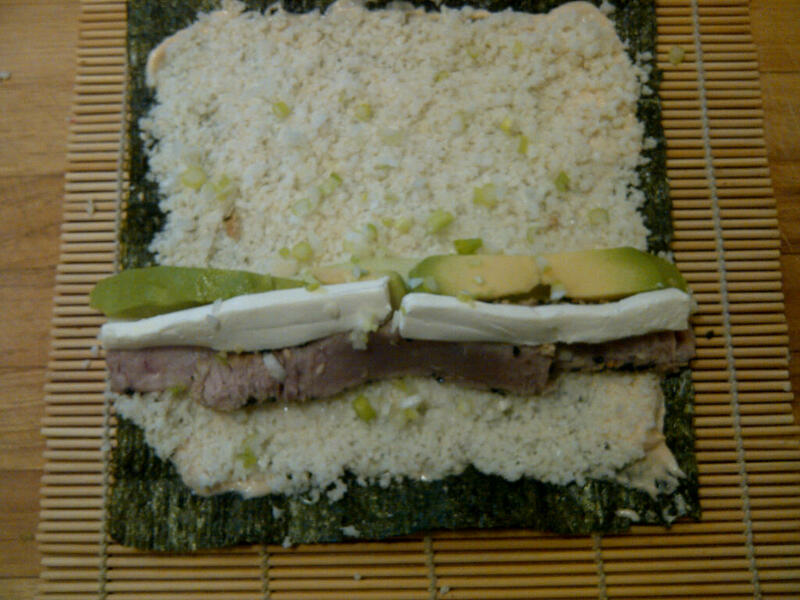 Traditional style homemade sushi that we created using rice and a large variety of ingredients. 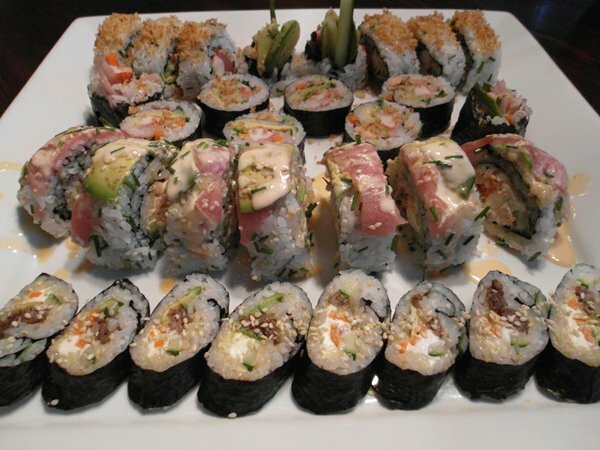 If you aren’t familiar with sushi, the sushi rolls are a combination of rice, usually in a seaweed wrap, with seafood, vegetables and sauces. They are beautiful and (I think), quite delicious. 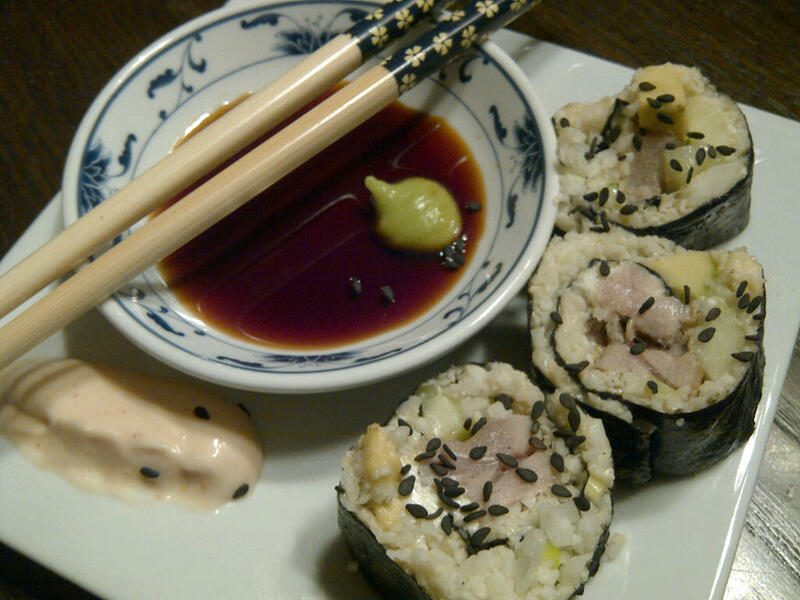 (A basic California roll is an example of a sushi roll that doesn’t contain fish.) Sashimi are the artfully cut pieces of raw fish, sometimes laid over shaped portions of rice, or laid on shredded vegetables in a serving dish made of ice. Served with soy sauce and wasabi, it is an explosion of taste and texture that is visually stunning. At first it was intimidating, but it didn’t take long sampling the raw tuna, yellowfin, salmon, scallops, squid, and bbq eel before I knew that I had been missing out on an entire realm of flavors. 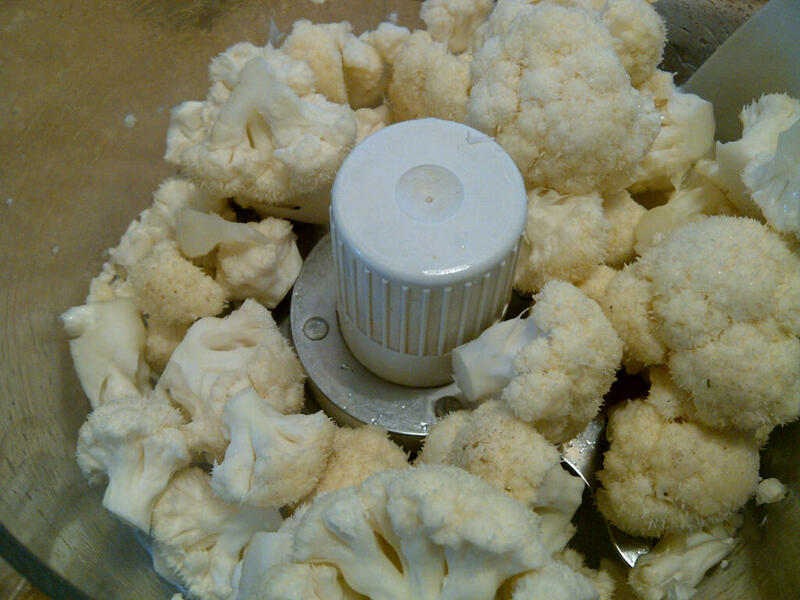 Cauliflower florets in the food processor. 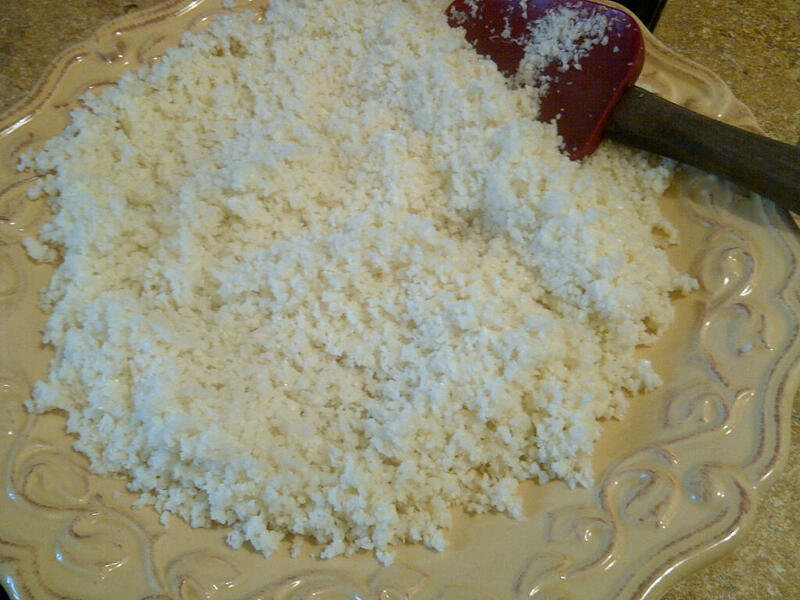 Cauliflower “rice” after processing for a few minutes. 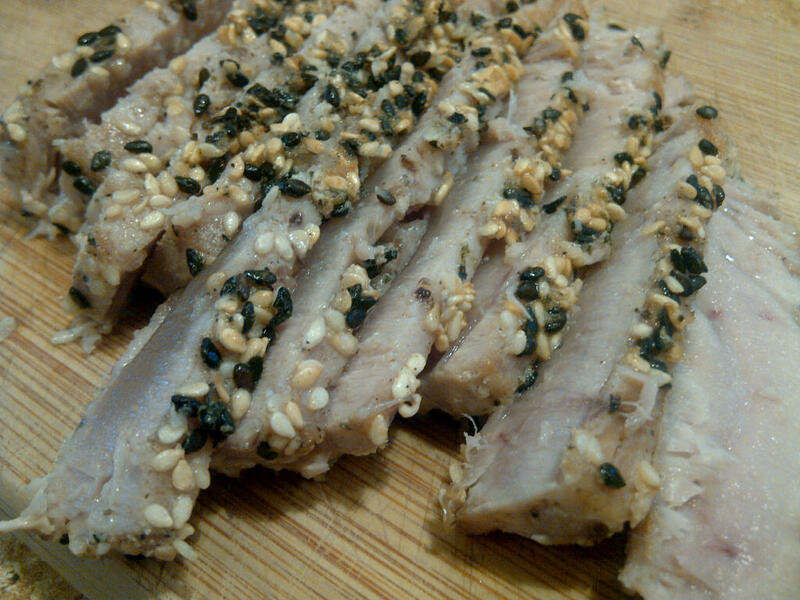 Yellowfin tuna briefly seared after being dipped in egg and sesame seeds. (Use caution when eating raw or under-cooked seafood. I have never had a problem consuming it rare or raw, but everyone is different.) We have also used salmon, scallops, shrimp, roast beef and anything else we have on hand! Not a bad way to make use of leftovers. 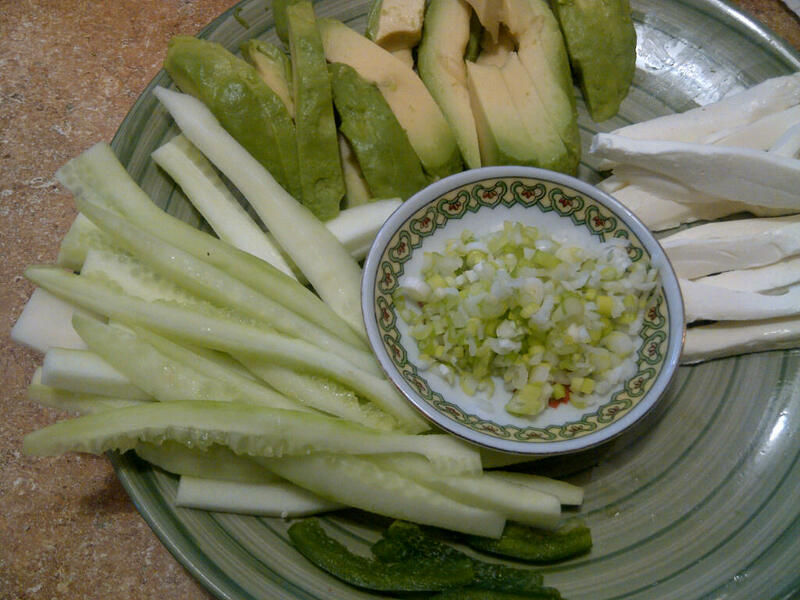 Plate of sliced veggies to fill the rolls; cucumber, avocado, green onions and cream cheese. You can use just about any ingredients that you enjoy! Our selection is usually more colorful than this, but I didn’t use carrots due to carbs and didn’t have sashimi salmon or roe on hand to brighten things up. 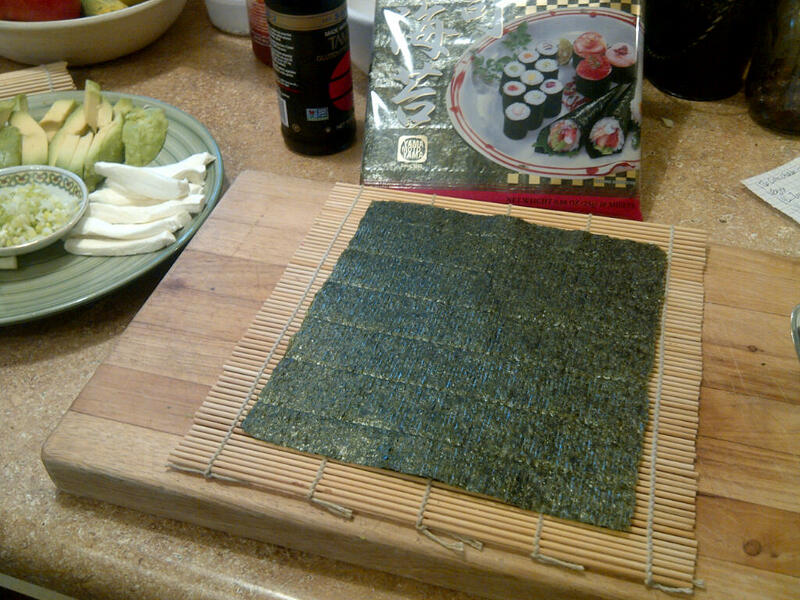 Sheet of nori (seaweed) laid out on a rolling mat. 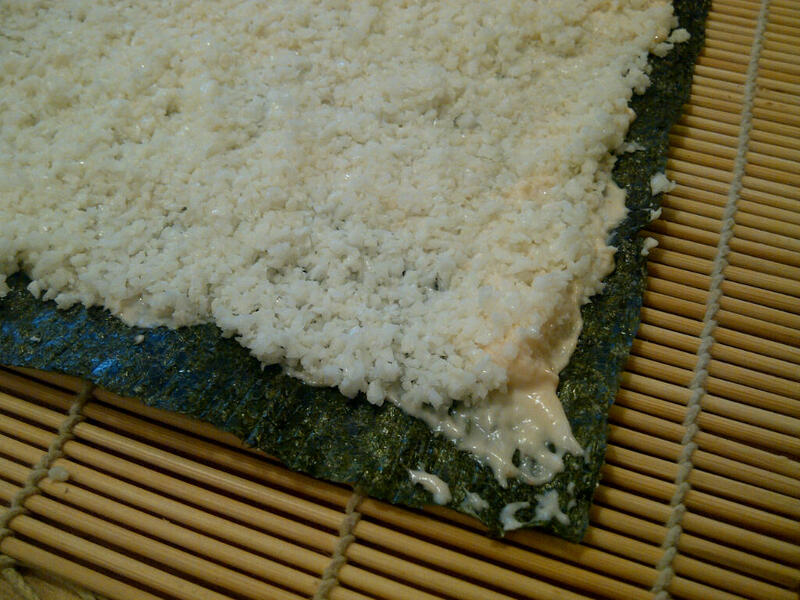 Sometimes it is helpful to place a sheet of plastic wrap between the nori and the mat to prevent sticking when using rice, but it didn’t seem necessary with the cauliflower rice. Cauliflower rice spread out on the nori with sriracha mayonnaise holding it in place. Sushi fillings laid out and ready to roll. Cauliflower sushi with tamari, wasabi and sriracha mayonnaise. 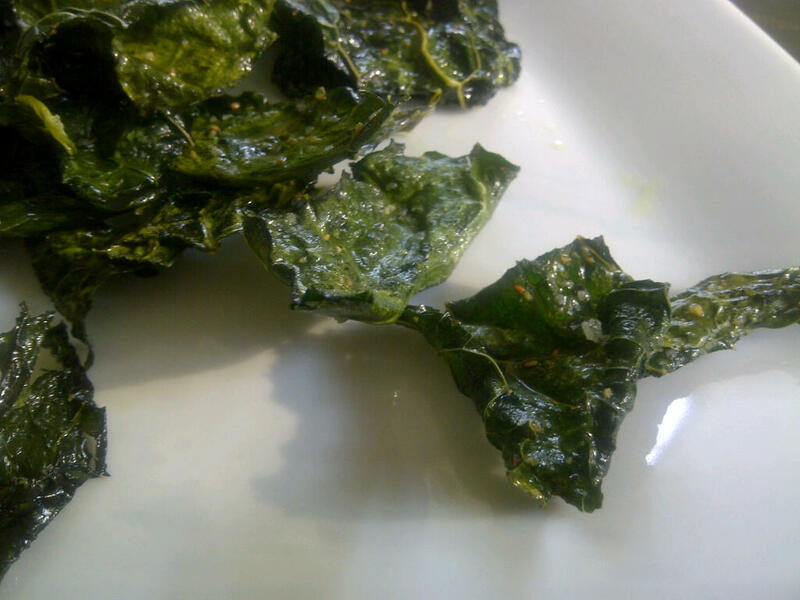 Kale Crisps… A Great Snack That’s Low-Carb, Grain-free, Sugar-free and Dairy-free! If you are following the Wheat Belly plan, eating Paleo, Primal, going low-carb, or just trying to boost your daily dose of nutrient-rich veggies, this recipe is for you! Kale is an incredibly nutritious green that has enjoyed a surge of popularity in the world of healthy eating. Some people love it raw in salads, while others are digging it in juice or smoothies. I will admit that I am SOOO not one of those people! I have *wanted* to enjoy kale, because I just love knowing that the food I am eating is fueling my body and giving me nutrients that support increased health. However, I was never able to fall in love with the slightly bitter flavor or tough texture. Now that I have FINALLY tried making kale chips, all that has changed! They are crispy, flavorful and nearly as addictive as eating potato chips without the carbs and hydrogenated oils… YAY! Even better, my teenage son loved them, and they are easy to make. I think I have finally found a substitute for popcorn while watching movies! RICH IN VITAMIN K~ Kale belongs to the Brassica family, which also includes broccoli, Brussels sprouts and cabbage, and all are rich in vitamins and anti-oxidants. However, kale has even more of the cancer-fighting vitamin K, weighing in at more than 1000% of recommended daily allowance of K per cup! In addition to reducing cancer risk, K also is known for supporting bone health and regulating the clotting abilities in blood. 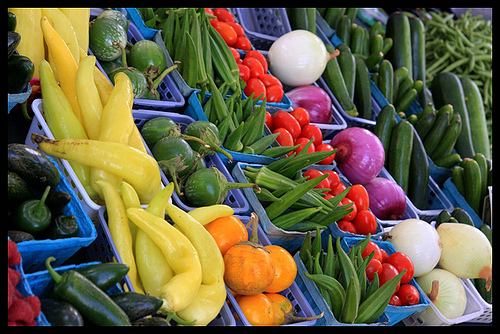 LOADED WITH VITAMIN A~ Another vitamin that maintains bone health is vitamin A. It also aids in vision, red blood cell production and tissue repair. One cup will provide 180% of daily requirements of A. GREAT SOURCE OF VITAMIN C~ With about twice as much vitamin C as an average orange, a cup of kale is giving you 200% RDA of this important nutrient. If you’re on a low-carb diet, kale can get you the C you need without spiking your blood sugar! PACKED WITH ANTI-OXIDANTS~ Carotenoids and Flavonoids are powerful anti-oxidants that protect the body against various cancers. These are also great for promoting the health of your eyes! HIGH IN IRON, CALCIUM & B6~ Containing more iron per calorie than steak, and more calcium per calorie than milk, kale is a nutritional powerhouse that just keeps on giving! With the added bonus of plenty of B6 for supporting immune system health and nervous system function, it’s a veggie not to be overlooked. 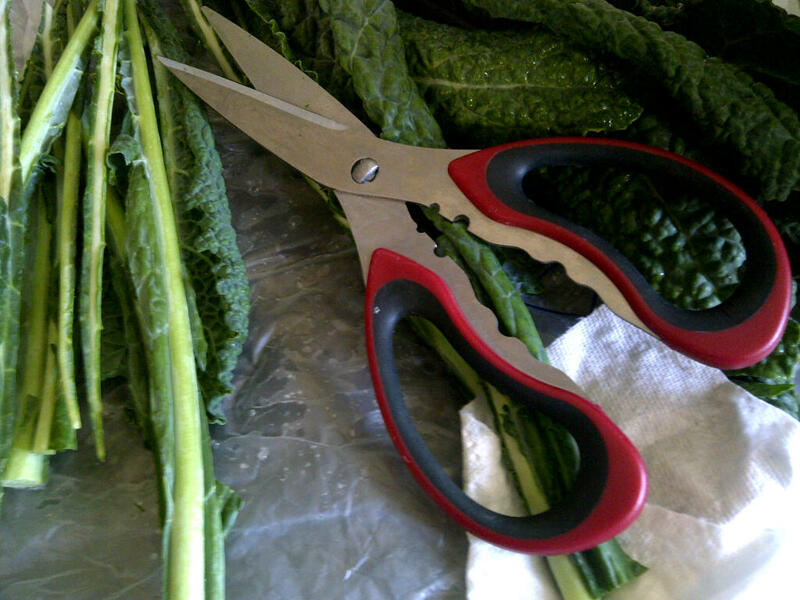 Trimming kale for oven-baked crisps. I used sharp kitchen shears to make the job easy. At the left are the discarded center ribs that are too tough to enjoy. There are numerous recipes all over the internet, with various oven temps and bake times, and using different oils and seasonings, and the following is my own adaptation. I felt that by keeping the temp on the low side, I would avoid scorching them, and would retain a few more nutrients than if they were cooked more quickly at a higher heat. Kale, with tough center stems removed and cut into pieces. Dried thoroughly. Directions: Heat oven to 275 degrees. Spread kale pieces on a baking sheet and toss in a tablespoon or so of oil to coat. Season as you wish and bake for 8-10 minutes. Remove from oven and stir/flip kale, return to oven for another 8-10 minutes. My kale crisps were slightly darker when they were done than when they went in, very light and very crispy! 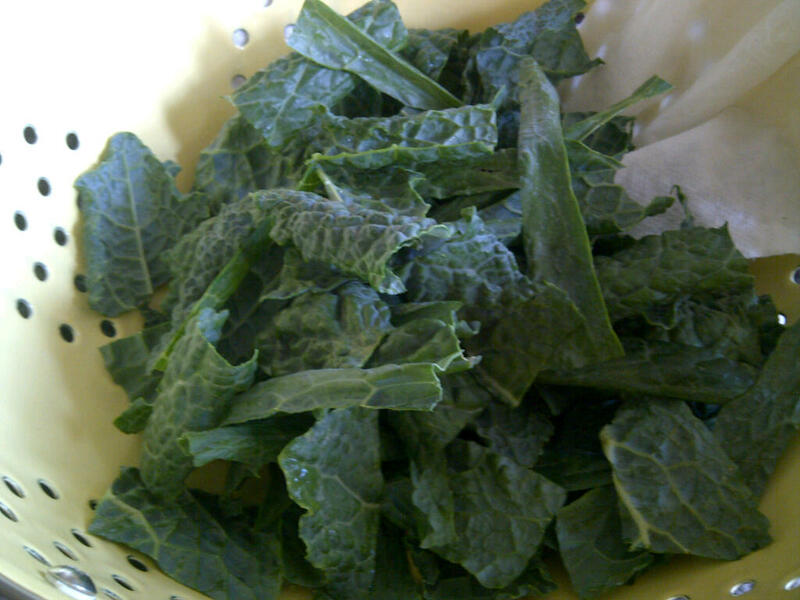 Colander full of washed and dried kale that has been trimmed of the tough center rib. The reason for suggesting grain-free and sugar-free, is that the GF (gluten-free) processed foods are made of alternative grains and they are every bit as high carb and bad for you as wheat products. We avoid GF packaged foods like the plague! They are the reason that going GF gets a bad rap in the press, and why some claim that going GF causes you to miss out on key nutrients. If you replace processed wheat foods with processed wheat-free foods, the improvement to your diet is minimal. However, if you fill that gap in the diet with more healthy food (which is naturally gluten-free), the payoff is incredible. You will not lose out on nutrients from bread (which are ADDED in the first place), if you eat in a smart way. How anyone can doubt that ditching processed foods (with all of their sugars, chemicals, colorants and toxins) is a GREAT idea for anyone, is completely beyond me! Friends often ask what we eat, and what to shop for, to get started. Remember, the best way to eat right, is to keep ONLY compliant foods in your fridge and pantry. That way, even if you are tempted to indulge, it will be with good foods. Shopping at Farmer’s Markets and Meat Markets is part of my weekly routine. We (husband and I) eat very few beans/legumes because they are high in carbohydrates, and often cause intestinal distress. Rice is a rarity that I save for sushi maybe once a month, but it is also high in carbs and we don’t purchase it for the pantry. We have stopped eating corn (partly because it’s a high-carb grain, but also because corn now contains its own pesticide within its DNA structure!) We don’t eat sugar either. The whole point of eating this way is to avoid BSS, which are blood sugar spikes that release insulin. Insulin is the fat storage hormone. The idea is very similar to Atkins or South Beach Diets, but grains are never added back into the lifestyle. You want to get to the point where your body begins burning fats as fuel, instead of carbohydrates. Therefore, it’s important to get enough fat in your diet, and eat plenty of food, just not high-carb foods. The goal is to keep NET carbs (carbohydrate grams minus fiber grams) between 20-50g a day during the weight loss stage. Within the first few days you will probably notice immediate relief from bloating and may lose a few pounds of water weight right off the bat. (My brother lost 17 lbs the first WEEK! Unheard of, but it happened.) Some people experience withdrawals from wheat, because it is actually addictive. I didn’t go through that, but my husband did for about 2 weeks. Even if you do experience a tough week, stick with it, it’s worth it! ~All kinds of meat, chicken, beef, pork (bacon is fine), fish, seafood. Grass-fed, free-range, organic and wild-caught are the best choices if you can afford them, but not necessary. 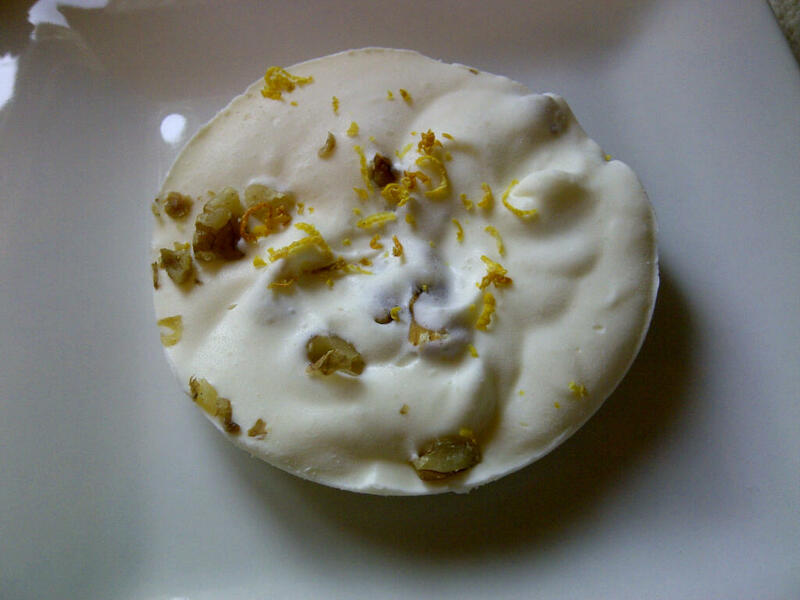 ~Full fat dairy, such as sour cream, cottage cheese, yogurt, mayo, heavy whipping cream. We eat these in moderation. Avoid skim and low fat milk as well, as it’s loaded with sugar and carbs. ~Greens like lettuces, cabbages, kale etc, fall in love with salads! ~Nuts and nut butters, especially almonds and walnuts, but others are good too. Just not too many peanuts. ~Dark chocolate 70-85% is fine in moderation; I have a couple squares most days and use it in recipes. ~Healthy fats and oils. We rely most on coconut oil and butter. Refined coconut oil is less expensive and doesn’t taste like coconut; Virgin unrefined coconut oil costs more and tastes coconutty (I love it.) Olive oil is good, walnut oil too. Avoid canola oil, corn oil, soybean oil and other vegetable oils, hydrogenation is VERY bad. ~Flax seed, ground. It’s good for adding omega 3’s. I use it sometimes in crackers or smoothies. It’s kind of nutty, and I think it’s an acquired taste. 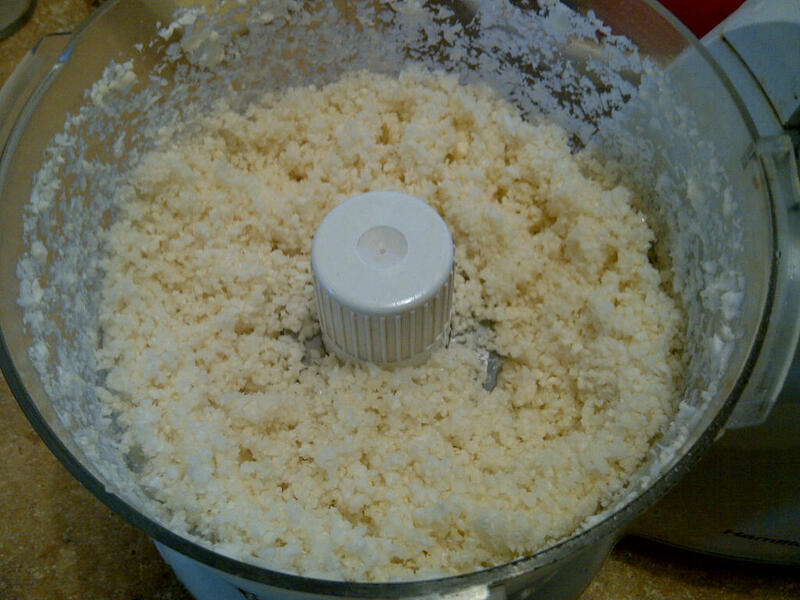 ~Almond flour and perhaps coconut flour if you want to bake something. 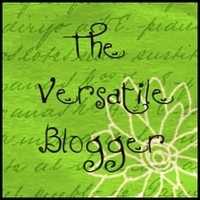 I have several recipes on the blog. Avoid rice flour, sorghum, tapioca, potato… all very high carb and starchy. ~For sweeteners, I mainly use Truvia, but also some Stevia and Erythritol (which I order online, it’s a sugar alcohol) as they don’t cause BSS. Honestly, I don’t crave sweets as much as I used to, so it’s mainly Truvia in my coffee or a smoothie, but also a little in desserts sometimes. ~Fruit in moderation. All types of berries are the best choices. We eat strawberries, blueberries, raspberries. Avoid the high-sugar tropical fruits like banana, mango, pineapple, papaya, or just have very rarely. So, that’s a basic run-down, but I am sure I have forgotten something. A typical meal for us is some type of meat with one or two veggies on the side, prepared in different ways, often with butter and cheese of some kind. We love creative salads. If you want sandwiches, we often use lettuce to wrap meat and cheese in with fixings. Stir-fries are great choices! 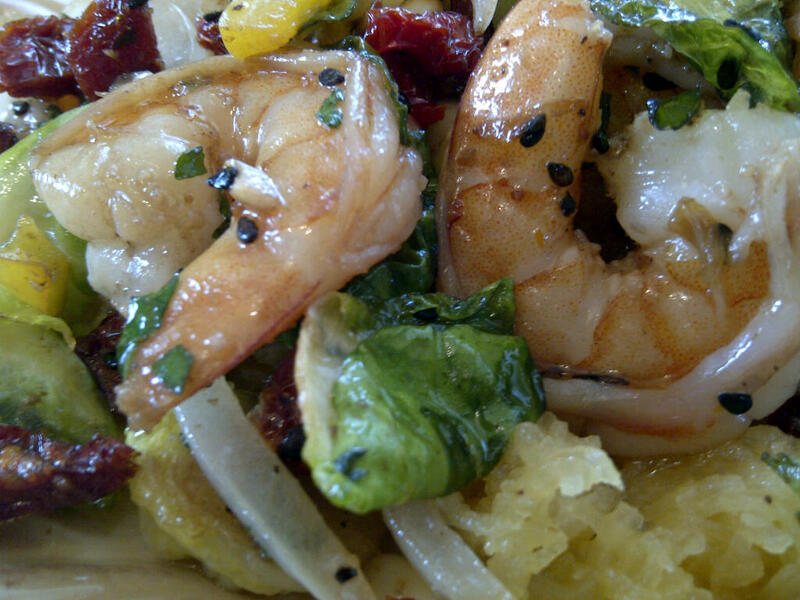 (Try my Tuscan Shrimp.). Grilling meat and veggies is good, as is baking. You can pan fry fish, chicken breast and pork chops using coconut oil (only), and coating the meat in eggs/mayo and pressing into a mix of grated Parmesan and almond flour with seasonings. (Or try the baked Parmesan Perch as a basis for other meats.) Super easy, very low carb. The hardest thing is just not over-thinking it, and getting used to eating REAL food, and knowing which things will spike blood sugar. Focus on what you can eat, instead of thinking about what you can’t. Let me know if you have any questions 🙂 or join many like me over on the Wheat Belly Facebook page! Seriously, it’s amazing that a best-selling author and cardiologist like Dr. William Davis has such an active FB page where he actually comments on posts from his followers. THAT is commitment! My husband and I have been following this plan for 5 months this week… and I have lost 27 lbs; Mitch has lost 31. Most of that happened in the first 2.5-3 months. I know I would lose more if I was perfect with it, but I still enjoy wine/cocktails which will stall weight loss 😉 Just remember that while weight loss is GREAT, the health benefits from following this plan are almost too numerous to mention!!! I hope that this helps for those that want to get started and need to SHOP!! You know those roasted cinnamon almonds you find at festivals? The ones that make your mouth water just smelling them… but you know they are loaded with sugar and carbs, so you just pretend that smelling them is enough? Well, you don’t have to fake it anymore! When these cookies were baking, my kitchen smelled just like cinnamon almonds, mmmm. 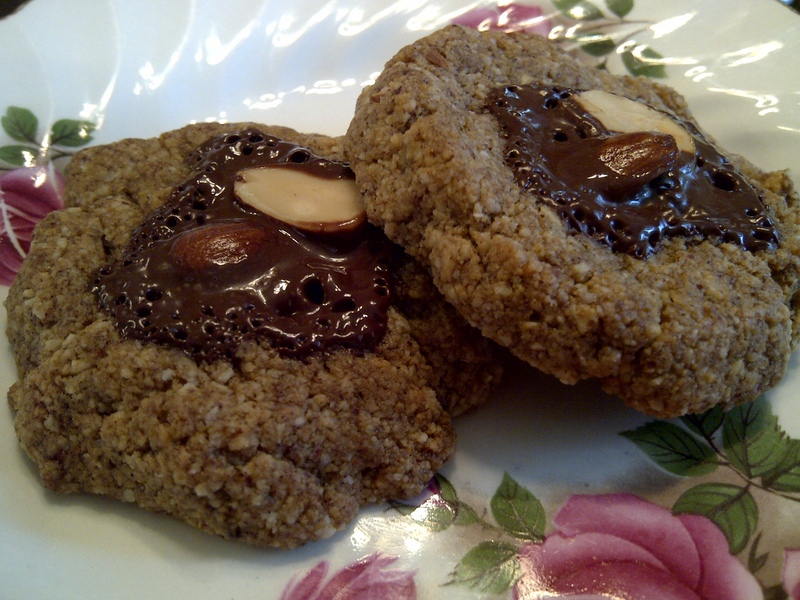 They are made with almond butter and almond flour, as well as sugar substitutes to keep the carbs low. 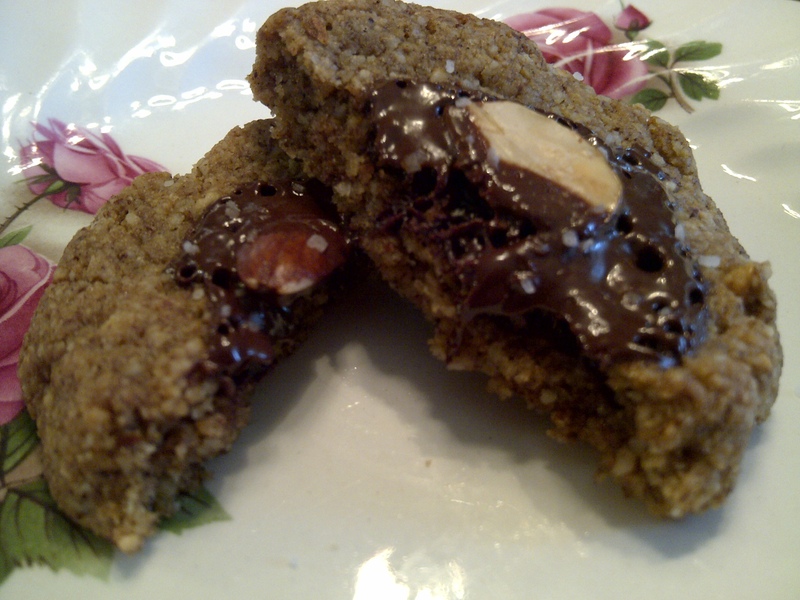 In fact, the carbs are SO low, that I added 70% dark chocolate, and they are still only 2.6g net carbs per cookie. No guilt or grain here! 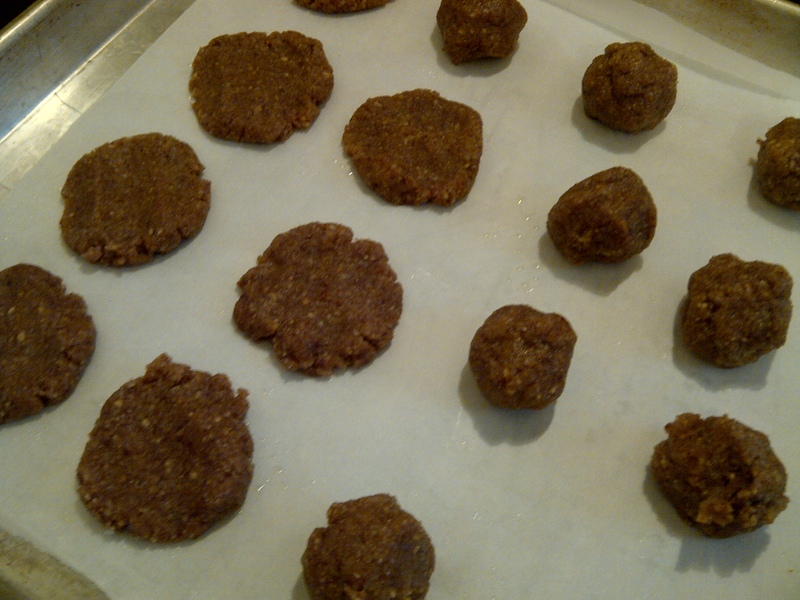 I found that the dough was a bit sticky feeling, and slightly oily as I shaped the balls, but it turned out nicely. 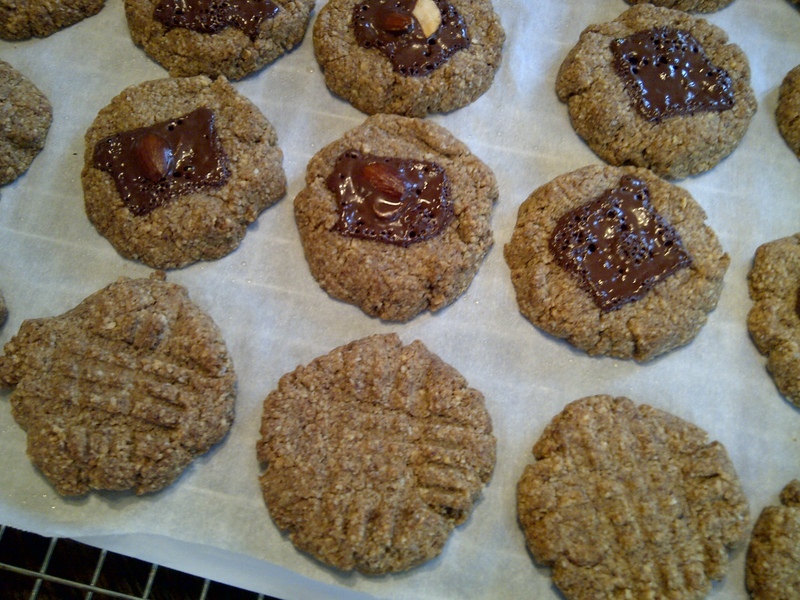 I tested a few different types in the batch I just made… one plain, cross-hatched like peanut butter cookies, one with chocolate pressed into the center, and one with chocolate and toasted almonds. No surprise that I liked that last version the most! I also sprinkled just a little large-flake kosher salt on them at the very end to set the chocolate off. If you like a mildly sweet cookie, I would start with the lower amounts of sweeteners, if you like it sweeter, adjust to your taste. I like mine a little less-sweet, as my tastes have changed over the past months. This is a slightly chewy, medium-dense cookie, pretty filling. I’d also like to note that this is the first recipe that I have made with the blanched almond flour that I just bought at our local bulk store (Countryview for those in my area!) and so far I like it! The grind seems similar to the flour from Nuts.com, and the price is $4.79 per pound. Preheat oven to 350. In a large bowl, combine first 6 ingredients and mix well. Sift together almond flour, erythritol, baking soda and salt, and add to almond butter mixture. 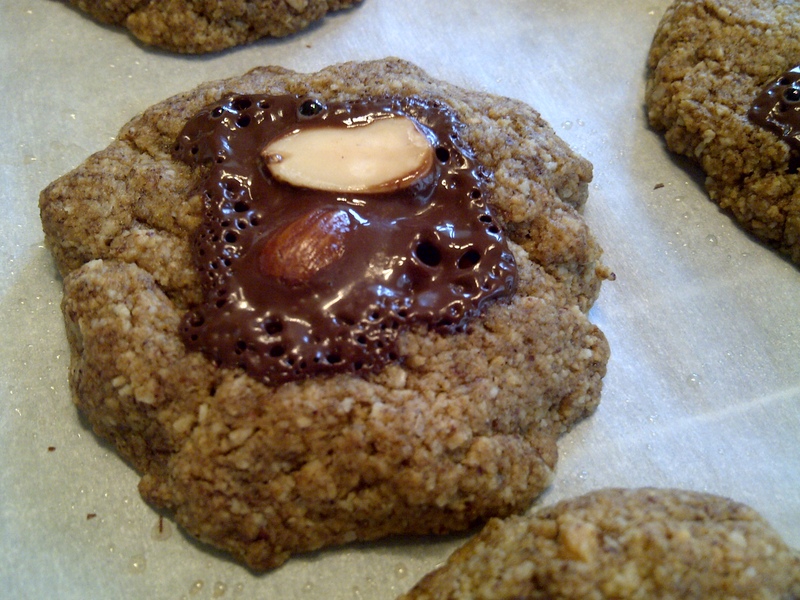 Drop by tablespoonfuls onto cookie sheet lined with baking parchment. Flatten balls into discs with your fingers. Wet fingers slightly if the dough is too sticky. 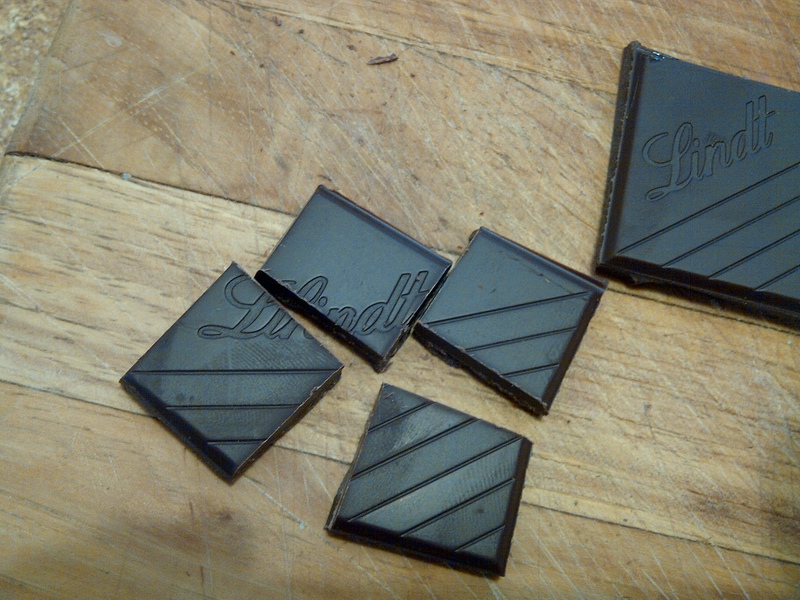 If using chocolate squares, chop each square into 4 quarters, and press one piece into each cookie. Bake for 3 minutes, and then remove from oven if using toasted almonds. Place nuts on top of the chocolate, rotate pan, and return to oven for 5-8 minutes for a total cooking time of 8-11 minutes. Remove from oven and cool on a wire rack. Makes about 20 cookies. 1.6g net carbs per cookie plain, 2.6 per cookie with chocolate pieces.